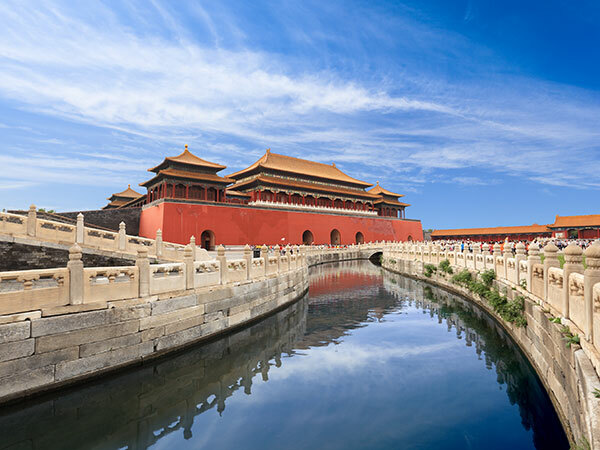 The Forbidden City, also known as the Imperial Palace, is the imperial palace of the Ming and Qing dynasties, and 24 emperors lived here in its 500 years . It, first built in 1406, completed in 1420, covers an area of over 720,000 m², and has a construction area of 150,000 square meters with over 9,000 buildings. The Forbidden City is well known as the world's five major palaces, and listed as World Cultural Heritage by the UNESCO in 1987. It has great historical meaning, and great construction value, cultural value and aesthetic value, and regarded as a symbol of China. Early start. 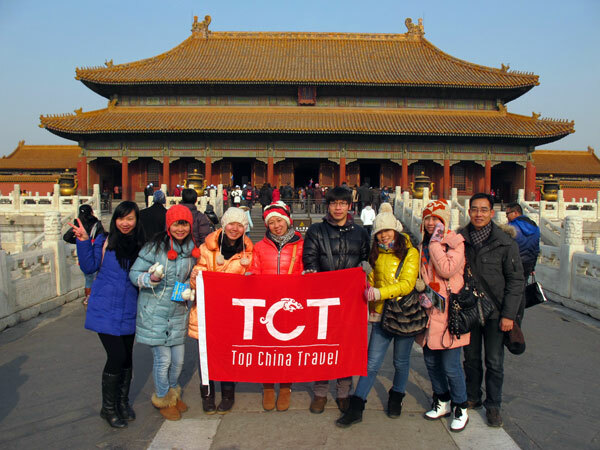 For one day tour, you should go to the Forbidden City in the early morning to avoid a huge wave of visitors and tourists, and buy your ticket in 8:30. Then you will have enough time to see this magnificent palace. How to get? You may take public bus No.1, No.2, No.120, No.52, No.59, No.82, No.88, and take Line 1 and Line 2 sightseeing bus. Or you may take Line 1 subway. By these, you can go Wumen, the entrance gate. Gates. The Forbidden City has four gates, Wu men( the meridian gate) in the south, Shenwu men( gate of divine prowess) in the north, Donghua men in the east, and Xihua men in the west. As a tourist, you should enter for visit from Wu men, and leave from Donghua men or Shenwu men. Audio guide. 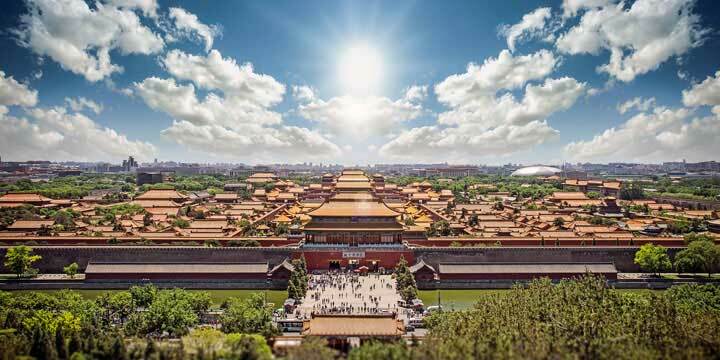 For a better visiting experience, you are recommended to rent a multilingual audio guide which costs 40 yuan with a deposit of 100 yuan, and it will start to expound the tour spots when you enter tour spots with the Forbidden City. After your tour is finished and you return the audio guide, you will get back the deposit. Must-see. This six places are must-see, especially the former three. Hall of Supreme Harmony (Taihe dian), Hall of Central Harmony (Zhonghe dian),Hall of Preserving Harmony (Baohe dian), Palace of Heavenly Purity(Qianqing gong), Hall of Union (Jiaotai dian),Palace of Earthly Tranquility (Kunning gong). Eating. For your lunch, you shouldn’t be worried. Inside the Forbidden City, there are restaurants available for you. Or you may bring some food for convenience. How to leave? After going out Shenwu men, you can take the following buses: No.101, No.103, No.109, No.58, No.685, and Line 1 and Line 2 sightseeing bus. The Meridian Gate( 午门: Wu men) is the main entrance of the Forbidden City, with a height of 37.95 meters, first completed in 1420, then renovated in 1647 and 1801. It has five doors, including three big doors and two small side doors. In the past, usually, Emperors pass through the middle big door, royal families use the right big door, and state officers use the left door. Hall of Martial Valor (武英殿: Wuying dian) has a front hall and a back hall, and two side halls. In the early period of the Ming Dynasty, Hall of Martial Valor is where Emperors meet state officers. In the Qing Dynasty, it is the office place where officers write, compile and print books, and it becomes a library and stores enormous books. And now, Ancient Book and Record Gallery, and Painting and Calligraphy Gallery are set in here. The Painting and Calligraphy Gallery has collected so many painting and calligraphy works, and some of them are the only ones existed. In here, you can see great calligraphic works of great calligraphers, like Lantingji xu by Wang Xizhi, and paintings of all schools. In this gallery, you know the developing course of Chinese painting and calligraphy by browsing those artistic works. Due to limited space, not all works are displayed at the same time, and exhibition works would be changed from time to time. Hall of Literary Brilliance(文华殿: Wenhua dian)is first used by Emperors’ first sons, and later, it is used by Emperors. Emperors study in here, read, write works and expound knowledge, and may have discussions with officers over topics. It has a back hall, called Weyuan ge, which stores books. Now, Ceramics Gallery is set up in this hall. The Forbidden City has over 350 thousand items of porcelains, and this hall exhibits over 400 valuable porcelains of supreme quality according to time sequence. In here, you can see porcelains made in the Neolithic Age, Shang Dynasty, Zhou Dynasty all the way to the Qing Dynasty, and through those porcelains, you will see the development of porcelain, and the advance of crafts in making porcelains. Gate of Supreme Harmony (太和门: Taihe men) is the biggest gate in the Forbidden City, before this gate, there are two large bronze lion statues. Hall of Supreme Harmony( 太和殿: Taihe dian) is the highlight of buildings in the Forbidden City, with the most important status among all buildings, which can be from its building materials and decorations. This hall is used to hold great events or rituals, like the ritual of becoming an Emperor and wedding ritual of an Emperor. It is the biggest hall of wood structure in the world, and built grandly and magnificently. Hall of Supreme Harmony has a double-roof, and on the edge of eaves, there are statues of divine animals to protect this hall. In the hall, you can enormous patterns of dragon on pillars, windows, ceiling, etc. One of the most prominent things is the dragon throne of Emperors and the screen behind the dragon throne. Hall of Central Harmony (中和殿: Zhonghe dian) is one of the most important three halls, and used by Emperors to meet officers, read sacrificial address, rest and think, and do other things. Inside the hall, there is a throne for Emperors, and in the front of the throne, there are meaningful animal decorations. Hall of Preserving Harmony (保和殿: Baohe dian), was ruined by fire once, and later rebuilt. It has a building area of 1,240 square meters, and 29.50 meters high, and its eave has statues of divine animals. Behind this hall is a long stone stairs with vivid dragon carving, which looks splendid. In the Ming Dynasty, it is used by Emperors to change clothes. In Qing Dynasty, Emperors meet officers of high position and royal families here, and still hold the imperial examination which is used to select governmental officers. Palace of Heavenly Purity(乾清宫: Qianqing gong) is the first one of the three major buildings in the inner court, one of the most important halls and the resting places of Emperors, who rest in here and also deal with governmental affairs in here. The hall has a building area of 1,400 square meters, and in front of the hall, there are two bronze statues of tortoise and crane, symbolizing longevity, and also sundial and grain measure, symbolizing justness. In the hall, there is horizontal board with a meaning of impartiality while in handling affairs. The hall is also used to hold a family feast of Emperors in the Spring Festival, besides, it is the place to put Emperors’ bodies before the funeral. Hall of Union(交泰殿: Jiaotai dian) one of the three major buildings in inner court, is the living place of Emperors and Queens and Emperors’ lovers. The ceremony of conferring the title of Queen and the birthday party of Queen are held in here. In this hall, there is a chime clock, and 25 imperial seals, and water clock. The chime clock has a height of 6 meters, and it is the biggest table clock existed, and it is the time standard used in the whole palace. At the exact time hours, it will give out loud and clear sound. The 25 imperial seals represent the authority of Emperors, which are used in different affairs, and they are kept in this hall. The water clock, made in 1745, is the ancient machine used to measure time. Palace of Earthly Tranquility(坤宁宫: Kunning gong) one of the three major buildings in inner court, is the living place of Queens, and it was ruined by fire twice, and later rebuilt. In the Qing Dynasty, first, Emperors and Queens lived here for few days after their wedding day. Later, it was rebuilt, rooms in the east side were living rooms, rooms in the west side were used to make sacrificial rituals, then it became a divine sacrificial place. After the period of Emperor Yongzheng, Queens do not live here anymore. Hall of Mental Cultivation(养心殿: Yangxin dian) is the living place of Emperors in the Qing Dynasty, who may meet officers, study, and live in here. It consists of several parts, and there are rooms for Emperors to deal with affairs and study, and rooms for Emperors, Queens, and imperial concubines to live, and rooms for praying to Buddha. Area of Six Western Palaces(东六宫区) is in the west side, behind Hall of Mental Cultivation, and it is a complex of six palaces for Hall of Mental Cultivation imperial concubines. Palace of Gathering Excellence is set in here, and it is the former residence of Express Dowager Cixi in her early life, who takes over the imperial authority from the Emperor. In front of this palace, there is a pair of bronze dragon, and a pair of sika deer. The dragon statue is unusually put in here, because it refers to Emperor and imperial authority, and other palaces lived by imperial concubines do not have dragon statues. Imperial Garden (御花园: Yuhuayuan) is on the central axis, behind Palace of Earthly Tranquility, and covers an area of 12,000 square meters. The garden has the style of traditional garden in ancient China, with pavilions, terraces, corridors , halls, rocks, trees, and those elements are in a beautiful layout. It is used for the royal families to rest and have a sightseeing. Area of Six Eastern Palaces is in the east side, behind Hall of Mental Cultivation and it is a complex of six palaces for imperial concubines. There are always some exhibitions for visitors. Hall for Ancestral Worship(奉先殿: Fengxian dian) is in front of Area of Six Eastern Palaces, and it is the family temple of the loyal family. In the back hall, there are compartments which have shrines for every Emperor and Queen, and each compartment has the same sacrificial things. On festival days and celebration days, in the front hall, there will be grand sacrificial rituals in the past. Hall of Clocks is set in Hall of Ancestral Worship, which exhibits lots of beautifully made clocks. In here, you may see clocks of ancient China, like sundial , water clock, and you may see clocks made by foreign countries, which come to China through trade. All those clocks are grandly made, with bright colors, exquisite design and superior craft skills. Area of Palace of Tranquil Longevity is the living palace of empress dowagers or Emperors’ mother, and in this area, there is a beautiful garden which first built in 1771 and completed in 1776, covering an area of 5920 square meters. The Treasure Gallery is set in Area of Palace of Tranquil Longevity, and it exhibits lots of treasures or art works made by gold, silver, jade, pearls, etc. All those treasures are made by superior craft skills, with beautiful designs. Some are used in sacrificial rituals, some are items of daily use, like porcelain and wine cup, and some are completely used for decoration, like rings or hair accessories. Gallery of Qing Imperial Opera is also in Area of Palace of Tranquil Longevity, and is the window for opera lovers to learn about opera and Chinese culture. It exhibits things related with opera, like play scripts, stages, opera dressing, still, it plays recording of imperial opera plays performed by the original players. Loyal families living in the Forbidden City love to watch opera performance which is the main entertainment activity to them. Gate of Divine Prowess (Shenwu men) is the back gate of the Forbidden City, in the north, and also one of the two exits for tourists. It is 31 meters high, and has three doors. The middle is used for Emperors in the past. For more information about the Forbidden City, please visit Forbidden City. After your day tour in the Forbidden city, you may go to Jingshan Park which faces to Gate of Divine Prowess (Shenwu men). Jingshan Park is the royal garden with hundreds of years, and it is the best place to watch the panorama of the Forbidden City and the whole Beijing. It has many attractions, Qiwang Tower, five pavilions(Guanmian Pavillion, Zhoushang Pavilion, Wanchun Pavilion, Fulan Pavilion, Jifang Pavilion, Shouhuang Hall, Yongsi Hall, Guande Hall, Peony Garden. and Wanchun Pavilion is the highest and best place to capture the whole of Beijing. In here, you could the old Beijing, and also the modern Beijing, and you see the panorama of the Forbidden City in the south side, the White Pagoda in Beihai Park in the west side and Bell and Drum Tower in the north side. Peony Garden close to Guande Hall, have plentiful peony, and in the spring, you could see these beautiful flowers. A 2-3 hour tour is enough for this tour spot. For more information about Jingshan Park, please visit Jingshan Park. After your tour of Jingshan Park, it will be a bit late, at about 20:00, then you may go to see Beijing night, and experience night life in Beijing. For this, I recommend you go to Wangfujing street. Go out Jingshan Park from the front door, walk about 200 meters to the imperial palace bus stop, take No.103 bus, and get off at Xindong’an market stops after tour stops, and walk about 300 meters to Wangfujing street. Why go to Wangfujing Street? Wangfujing Street is a famous business street, where you can eat lots of Beijing snacks in the food street, buy various handcrafts in some small stores, go shopping in shopping malls, visit Wangfujing Church and see people playing in the square in front of the church, see many statues along the street and enjoys its beautiful night scenery. For more informatin about Wangfujing Street, please visit Wangfujing Street. After a night tour in Wangfujing street, you may go back to hotel to compile and save your photos, and have a good rest.